Expert service delivered how, when, and where you want it. 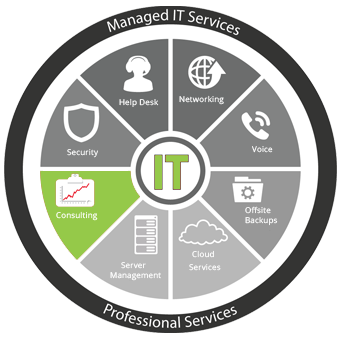 TechHeights is a certified and highly recognized provider of IT support Irvine, CA. When looking for complete network and computer support, it is important to have someone who will thoroughly evaluate your current IT infrastructure needs and make accommodations for any future expansion plans. TechHeights offers a range of IT services Irvine, CA and can provide solutions from concept and site design to ongoing site maintenance. Our record of proven delivery will give you the IT services in Irvine, CA that you need to expand your business. Our comprehensive server and workstation management services are designed to achieve higher up-time for business applications and emails, resulting in increased productivity. Our certified team is always on top to ensure that all the patches, anti-virus and backups are in place..
We offer Small and Medium Enterprises with managed IT Network support and services that provide total life-cycle of your IT infrastructure, from planning and design, to implementation, operations, security, and maintenance. Our services ensure that IT Network is stable and protected..
Our network security services provide protection across the network, protecting the perimeter, internal assets like servers and workstations, application data, remote users, customers and partners. We provide step by step help to our customers for regulations including PCI and HIPAA compliance..
We offer server consolidation design and implementation services for Virtualization platforms including Microsoft Hyper-V, VMware VDI /ESXi and Citrix. We help our clients identify right cloud solution and help migrate your backups, emails to Office 365 / Google Apps and hosting applications..
What Service Packages Does TechHeights Offer? Do You Offer Computer Maintenance or Network Administration Services? The team at TechHeights is proud to offer both System Maintenance and Network Administration. All network systems and computer equipment will require ongoing maintenance for optimal performance. This maintenance is also crucial to protect your data. TechHeights will carefully maintain the client’s IT infrastructure with service packs, security patches, up-to-date system upgrades and back-up processes. We have extensive experience maintaining a variety of platforms, computer software and hardware types and networks. If you are looking for IT support Irvine, CA, choose TechHeights. Many companies are now turning to cloud services for hosting emails, files & folders and backups. TechHeights offers migration services to provide a smooth transition from client’s old email system or file server to Microsoft Office 365 or Google Apps with upgrades, changes and conversions. What Type of IT Support Services Do You Offer? The team at TechHeights understands that the right combination of system components and technology is unique for every business. That is why we are happy to offer IT Support Irvine, CA to bring you the best solutions. To do this, we focus on balancing business needs, security, performance and cost. Emergency Support Services – Our highly trained team of Microsoft certified engineers can quickly arrive at your site within 4 hours and offer you diagnostic and resolution services if your business experiences any critical issues, especially during normal operating hours. Troubleshooting – Some common network issues can be avoided with regular maintenance. However, many of these issues cannot be completely eliminated. That is why TechHeights offers two layers of troubleshooting protection: TechHeights will perform periodic system assessments to identify potential or emerging threats as well as assist your business with regular system maintenance. TechHeights can also provide emergency troubleshooting that will quickly diagnose and correct any problems. Consulting CIO –TechHeights is proud to offer a consulting CIO who can advise clients on the best trends, technology and policies to help prioritize and execute a set business strategy. Does TechHeights Offer Network Services in Irvine? Complete Network Installations –TechHeights can help clients with their network needs from start to finish. Our end-to-end network solutions include everything you need such as wireless, hardware, software and cabling. If you need to set up an entirely new network infrastructure or completely overhauling an existing one, TechHeights will successfully manage the job including planning and on-going maintenance. Computer and Network Support – The team at TechHeights takes a proactive approach to mitigate any network, server or security issue before it becomes a problem that disrupts the operation of your business. Network Security – Individuals and businesses should understand the importance of protecting themselves when using Internet systems. Increasing connectivity is great for business, but it can also cause security risks with your network. TechHeights offers comprehensive security solutions including anti-virus software, backup, disaster recovery and regulatory compliance. Network Monitoring and Alerting – Managing servers, applications, workstations and mobile devices in a network is extremely time-consuming and can be overwhelming if the manager is not properly trained. To solve this issue, TechHeights provides 24 hour, 7 days a week, 365 days a year monitoring of critical technology pieces that support your business, leaving you to focus on other things. How Can You Prevent a Data or System Disaster? A tech disaster can cause system failure and data loss that can range from minor and inconvenient to catastrophic. To prepare for such disasters, TechHeights will assist with the planning and implementation of a Disaster Recovery Management plan and Data Protection Strategies. Can You Help Train My Staff for Day-to-Day Tech Operations? TechHeights can offer smaller organizations access to effective training for existing staff. This training allows one staff member to serve as a “system coordinator” who handles basic system maintenance. This allows for a much smoother day-to-day operation. What If I Do Not See My Tech Need On This Page? If you do not see what you are looking for above, give us a call or send us a query. When you want effective teach support Irvine, TechHeights will offer customer system solutions that are perfect for your business. These solutions will help create an effective and highly efficient IT environment. Our IT services Irvine, CA are extremely well-formulated and are always professionally implemented. Each offers a strategy that is built on the organization’s specific IT needs. When you need IT Support in Irvine, CA, be sure to choose the highly recognized and experienced team at TechHeights.